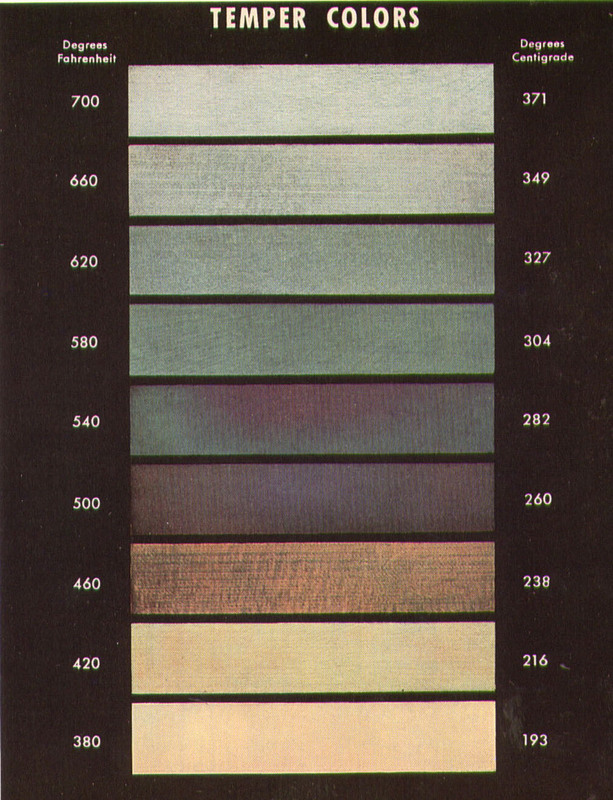 Temper colors of 0.95% carbon steel at temperatures indicated. In steels, tempering is reheating hardened steel to some temperature below the lower critical temperature for the purpose of decreasing hardness and increasing toughness. Tempering is also sometimes applied to normalized steels. For the same reasons- decrease hardness and improve toughness. I saved this chart back in my youth from a Bethlehem Steel Handbook. This entry was posted on Wednesday, July 14th, 2010 at 4:11 am and is filed under Engineering, Shop Floor, Uncategorized. You can follow any responses to this entry through the RSS 2.0 feed. You can leave a response, or trackback from your own site.